While walking around the AGTA GemFair™ Tucson, you may meet a confident, yet humble, gentleman moving through the crowds. 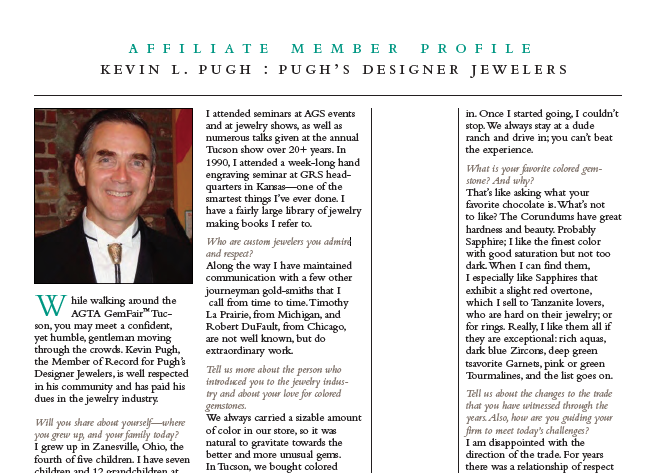 Kevin Pugh, the Member of Record for Pugh’s Designer Jewelers, is well respected in his community and has paid his dues in the jewelry industry. Will you share about yourself—where you grew up, and your family today? I grew up in Zanesville, Ohio, the fourth of five children. I have seven children and 12 grandchildren at the moment. Tell us the fascinating story of how you got your start in the jewelry industry. My father was a local watchmaker/Registered Jeweler in a small, full-service AGS store. I began at age 15, building and engraving trophies. I learned to size rings, set gemstones, and do general repairs during high school. In my freshman year of college, the store was growing and I was needed to run the shop. So I quit school and never looked back. Tell us about your journey from your beginning in the jewelry business to today. Where you trained as a jeweler, etc.? I had little formal training in jewelry repair and construction methods, but I had the freedom to try new techniques, and I have always lived by the motto “the impossible just takes longer.” A plaque in front of my bench, visible to the public, reads “Those who say it cannot be done should not interrupt the person who is doing it.” I attended seminars at AGS events and at jewelry shows, as well as numerous talks given at the annual Tucson show over 20+ years. In 1990, I attended a week-long hand engraving seminar at GRS headquarters in Kansas—one of the smartest things I’ve ever done. I have a fairly large library of jewelry making books I refer to.